WPI's project-oriented curriculum prepares students to engage in lifetimes of professionalism and learning. The Major Qualifying Project (MQP), a senior capstone experience, prepares students for life beyond college and gives them a leg up on the competition when it comes to launching careers and gaining admission to professional schools. The MQP in Biology and Biotechnology (BBT) is far from trivial. It requires a substantial part of an academic year and culminates in a project report and presentation. The project can be performed in a faculty member's research lab, in the department's ProjectLab, or on off-campus sites such as the University of Massachusetts Medical Center, Tufts University, Brown University, Harvard University, and area biotechnology companies. Alzheimer’s disease is the fifth leading cause of death in the US. This neurodegenerative disease involves neuronal death associated with amyloid-beta (AB) plaques. Current treatments can manage symptoms, but there is no cure for Alzheimer’s disease. Our study focused on C. elegans models of Alzheimer’s disease and the ability of punicalagin and tannic acid, plant polyphenols, to prevent the onset of disease symptoms. Behavioral assays were used to study the ability of these extracts to combat the effects of AB expression in C. elegans. These assays tested chemosensory and muscular deficits, similar to olfactory defects and paralysis seen in patients. Our results suggest that punicalagin reduces neuronal deficits caused by the expression of AB, while tannic acid does not. Artemisinin, an antimalarial drug, is a specialized metabolite produced in glandular trichomes by the plant Artemisia annua. Artemisinic derivatives in combination therapies are currently used to treat malaria. Understanding regulation of the artemisinin pathway will lead to production of higher yielding plants for use in treatment. Currently in the Weathers lab, one high producing artemisinin chemotype, nS, and a low producing artemisinin chemotype, n15, are used to study how this pathway is regulated in A. annua. Prior metabolite data of cross-grafted plants indicated that the rootstock of nS stimulated artemisinin production in n15 shoots, and n15 rootstocks inhibited artemisinin production in nS shoots. In this study, I measured transcripts of two transcription factors, AaWRKY1 and AaERF1, and one artemisinic enzyme, DBR2. Results showed that the transcription factor AaWRKY1 was significantly down regulated in the shoots of the 15/S grafts. 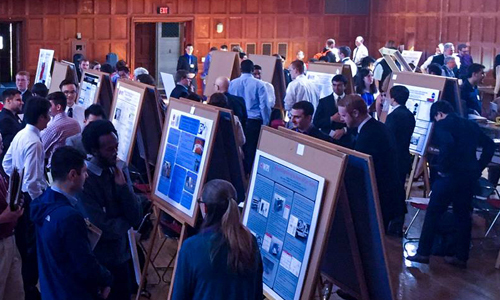 In April WPI holds its annual Project Presentation Day, during which students present their research to peers, faculty, and invited guests in recognition of the accomplishments they have achieved through their senior capstone experiences. BBT students have opportunities to complete their MQP’s at WPI’s project center in Eilat, Israel. Under the guidance of local sponsors, students can undertake innovative projects on topics including genetics and molecular biology, cell biology and cancer, biology of health and disease, conservation and applied ecology, and brain and behavioral sciences. For her Major Qualifying Project, Biology & Biotechnology student Victoria Mason had the opportunity to help address a public health problem in Ghana. Residents were being infected by the Schistosomiasis parasite, which lives in the local river. Vicky tackled the problem from a scientific perspective and also leveraged her experience as a double major in Professional Writing to probe the human context in which medicine is practiced.